Today we’ll be combining two of our favorite headphone technologies in the best Bluetooth active noise-cancellation headphones. Of course, it won’t be very budget-friendly, but as we gather both wireless capability with ANC to aid in our privatized listening, it can be well worth the investment if you intend on using these features to their fullest. 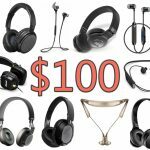 We ultimately had to gather quite a few picks here since the “best” for you will depend on a few factors we always recommend our readers, such as budget, headphone type preference, as well as a few other ‘features’ that may be added on to these pairs below to increase the price. First of all, is noise-cancellation technology worth it? What about the difference between noise isolation vs. noise-cancelling headphones? Why is one more expensive than the other? These are a few questions we’ve gotten from not only our readers but friends and family as well. We always refer them to the previous articles we’ve linked to help spell out the differences as well as pros and cons of ANC (active noise-cancellation). 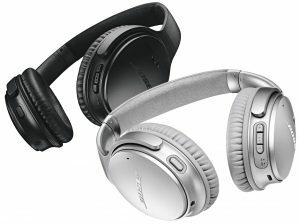 To sum it up, noise-cancelling headphones have an advanced mechanism to them, hence the higher price (at times). Most have tiny little microphones located on the exterior of the headphones in order to “pick up” the sound from outside and “cancel” them out by using a technology to invert the sound-waves before they hit your precious ears. 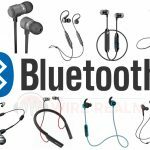 Bluetooth range: It may not be completely important when it comes to headphones (as compared to perhaps Bluetooth speakers), but the range in which you can freely roam may be important to you. The average is about 30 feet, and most don’t go under that, especially in our list below. Playing time: Although we’re met with two advanced technologies today, its unfortunately the worst combination to have when it comes to ‘playing time’ and how long the battery of your headphones will last. No big deal to some, for others, it may be a big “no”. The average here is about 6-8 hours, so you’ll be getting one or perhaps two days worth of playing here. It won’t be a big deal if you can remain disciplined with keeping them charged over night until next use. Controls: Without wires, we can’t have a ‘control center’ usually found in consumer-friendly pairs of headphones, which is a big deal for us in our experience. After using a control center for years we don’t go near headphones (unless we’re in the studio) that don’t have at least some type of convenient volume, song, or call control. 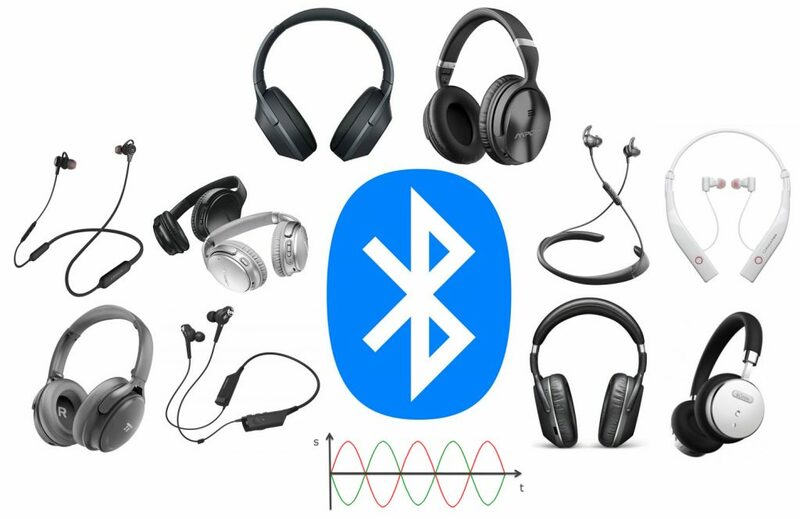 For Bluetooth headphones, in-ear headphones are able to get away with having a small wire to connect each ear-piece, so typically there’s a control center in the middle of that. 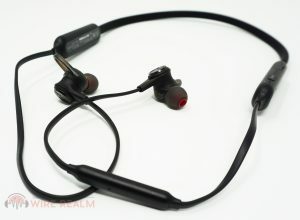 Over-ear and on-ear headphones however may not have controls at all, or some higher-end pairs have mechanisms on one of the earcups to do so. Keep this in mind as you browse. On-Ear: Many will confuse this type with the previously mentioned over-ear. However, that ‘on-ear’ term implies what it means — earcups that are substantially smaller than over-ear headphones and actually rest on top of your ear instead of completely surrounding them. The different between over-ear and on-ear isn’t too big of a deal, but many do prefer on-ear since they give a different type of feel, sound and overall quality to them. In-Ear: Also known as earbuds (there actually is indeed a different between in-ear vs. earbuds, however to keep it simple, we’ll clump them up into just one here. Just keep in mind in-ears actually protrude into your ear canals whereas earbuds are slightly larger and ‘rest’ in your ear canals). These are the traditional headphones people wear around town, in the gym, or really any time you see those ‘air pods’ around. Uses will vary, and it will depend on your personal preference for noise-cancelling Bluetooth headphones today. As one of the most popular noise-cancellation series of headphones in the entire market (and will be for quite some time), the QC’s by Bose bring us a high-end, high-quality build and overall sound if your budget has a decent amount of cash at hand. Great for travel or really any type of personalized listening desired, the specs here don’t just include a familiar brand name. You’re getting a whopping 20 hours of playing time (this is very long for these types of headphones, but the money pays for it here), 15 minute charge per 2.5 hours of listening time, volume-optimized EQ drivers, and a carrying case in the box. They also let you use Google Assistant for just about everything, from voice activated phone calls, text messages, calendar reminders, and even adjusting the volume of your music. You don’t even have to lift a finger to get Google Assistant to work, making these the literal definition of a hands free headphone set. Plus, these headphones are designed to be durable, lightweight, and provide superior noise cancellation technology that actually works (you can turn it off if you need to conserve battery). The build also includes comfortable Alcantra cushion in the headband and earcups as well as corrosion and impact resistance for increased durability. Yes, they are a little on the expensive side, but with the high quality design and extensive features that make you feel like a boss, the Bose Quietcomfort 35 II are one of the best Bluetooth noise-cancelling headphones you can find on the market if your budget allows. We’re very familiar with Sennheiser for their dominance in the studio headphones category, but in terms of noise cancelling headphones they definitely have the features to back a well-reviewed product. The PXC 550 headphones are becoming a valid competitor to Bose’ QC series (finally), coming with similar features and build. Let’s compare some key specs here — Sennheiser’s NoiseGard Hybrid adaptive noise cancelling technology, a playing time of (up to) 30 hours (claims by users around the net state it’s around 19 to 22 with the ANC on, so the same as the QC), with a full charge time of about 3 hours. They keep everything within reach with the simple touch-sensitive track-pad design, allowing you to compartmentalize your headphones to the earcups with included touch sensitive lining to make it easy to change your song or adjust your volume. Plus, to build on the added necessity of the hands-free feature, these headphones are designed to cancel out ambient noise while you are making any sort of phone call, giving you great clarity in your conversation without ever having to reach for a phone. This is all for about the same retail price (we say ‘about’ because some sites may have these or the QC 35 II discounted, so it may come down to whichever pair is priced lower at the moment). A high quality option for the price, the Sennheiser PXC 550 offers one of the best noise cancellation Bluetooth headphones available that give us flexibility in pricing if you wanted to compare these with our first pick. Now let’s get into the best Bluetooth noise-cancellation headphones if you’re looking for an in-ear build. Technology seems to always working to “one up” the competition, and at times that even includes their own company and brand. There’s always a better way to make something, and the ability to provide as many features as possible has become the norm. 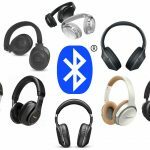 At least, that’s what we think of when I look at the features for the ATH-ANC40BT headphones, which come with the capability to pair with up to eight different devices through Bluetooth connectivity. This can all be done simultaneously, with your audio fluidly changing with whatever device you choose. For ANC, these headphones also contain a tiny microphone and a noise-canceling wave within each of the earbuds that reduces all external noise so that you can focus on the audio of your choice. However, even with all these upgrades, the maker of these headphones still understands that not all areas are receptive to Bluetooth device. Therefore, to make sure your headphones can be used in any situation, a classic connector that is compatible to most devices is included. So yes, while there is always the drive to find more features and make things as simplistic as possible, we think what makes the Audio-Technica ATH-ANC40BT one of the best Bluetooth headphones on the market is the inclusion of functionality over flashiness, which makes your purchase far more practical in the long run. Since they’re in-ears, you’re getting less power as it’s more difficult to pack in larger drivers, but the overall sound quality and volume here are high-end for sure. The smaller size also limits us to a playing time of about 8 hours (13 without noise-cancellation). When many think of the Sony brand, I think of game systems such as gaming stations or other consumer electronics, and some of their headphones to be honest are hit and miss. However, the WH-1000XM2 headphones have made their name in the ANC game with many user reviews backing up its effectiveness, especially with the smart noise cancelling tech that’s meant for an on-the-go lifestyle and headphones that can adjust with it. And yes, I do mean adjust, because that’s what reviewers appear to enjoy the most about these headphones. These actually sense the atmospheric pressure of wherever you are allows the headphones to adjust to the needed volume to ensure no external noise interrupting your sound (great for avid plane riders). Also, for those moments where you need to pause your music for a short conversation, it simply takes covering the ear cups to lower the volume immediately. In addition, for those people out there who, like me, maybe have needed accessories to make it through the day (my glasses and I are bonded for life), the WH-1000XM2 takes this into account to adjust and continue to eliminate ambient noise. Another plus is the included accessories in the box — carrying case, airplane adapter plug, and a cable in case you’d like to eliminate Bluetooth to save on some battery for a while. 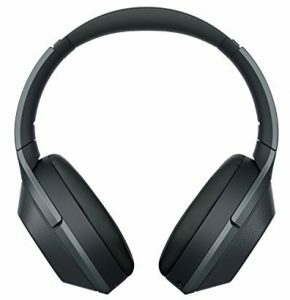 So yes, Sony is great when it comes to games, movies and other electronics, but in terms of noise-cancelling headphones, they also have some of the best options on the market with the Sony WH-1000XM2. It’s slightly cheaper than the previous over-ear picks, so if you still want a high-end Bluetooth noise-cancellation pair of headphones but want to save a few bucks, here’s your pick. 30 hours of play time here with needing just 10 minutes to charge the headphones for an extra 70 minutes of enjoyment. Let’s take us down a few steps into a lower price-range for some options. No list would be complete if there wasn’t a budget friendly option available, and that’s where the BOHM B66 make sure to keep this review covered. 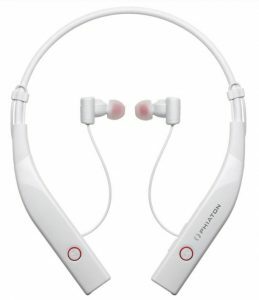 A reasonable price for a well reviewed product, these headphones have all of the main features of any of the higher end options, including noise cancellation, Bluetooth capability, hands free phone calls, and multi-device adaptability. The batteries are rechargeable, and can last up to eighteen hours, which lets you “play” with a variety of uses without constantly checking to see if they may die at any moment. 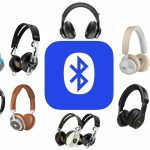 As an added bonus, the Bluetooth will continue to pick up your devices (smartphones, tablets, etc.) from up to ten meters away, meaning that you don’t have to be constantly connected to your devices in order for your sound to work. The build is pretty solid however not as rugged as many others with higher price-tags, but can last you quite a while if you take proper care of them. The comfort will be fine, albeit no leather or Alcantra like a few previous other picks. Indeed this is one many will buy to save some money. 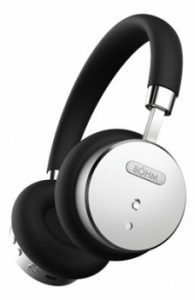 One of the best Bluetooth noise-cancelling headphones in the lower-end, the BOHM B66 is a quality option at a practical price. If you were infatuated at the previous QC 35 II but instead needed some in-ear headphones, here’s Bose’ option of that same highly reviewed series. 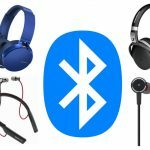 These Bluetooth noise-cancellation headphones are designed to be lightweight, easily portable, and free to give you flexibility to move through their Bluetooth capability. It will adjust to whatever environment you are using them in while cutting out all external noise using the same noise-cancellation technology their other popular QC models have (slightly different to adapt to the smaller size, but still extremely effective and one of the best out there in the in-ear department). Plus, the in-ear design works to act as a seal between your audio and the sounds of the outside world for some extra isolation as compared to over-ear counterparts. Combine the design with higher-quality ear tips and overall build, and the price here starts to make sense. Additionally, with an app designed to give you customized control into the setup of your sound, it’s easy to create a personalized and unique listening experience (read more about the Bose Connect app if you’re interested — you basically save presets for environments you’ll be in). With reviews praising the quality of sound and comfort, the Bose QuietControl 30 headphones are one of the best options available today. There’s also a convenient control center on the cable to control music and answer phone calls, although the design again limits us to about 10 hours (the highest we’ve seen with this design, however). The BT range is 33 feet. 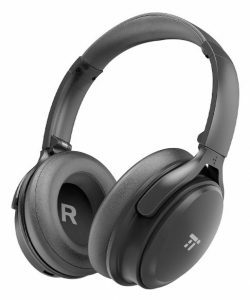 Another budget friendly option to add to the list, the TT-BH22 headphones are considered to be the one of the best noise cancellation headphones for a steal of a deal. With a simple flick of a switch, these headphones can activate their noise cancellation technology to reduce external noise and help counteract with your own music played at the balanced precision you should always be hearing. Able to last for up to twenty-five hours on a full battery, the TaoTronics headphones boast decent sound for the price, but comfort as well. Lined ear cups work in tandem with a comfortable headband to fit your head exactly as you need it to, adjusting around your head to lock your music in place and let you hear your audio (whether it be your personal playlist or a hands-free phone call) with effectiveness. The volume and song selection are controlled by the same buttons, with a short tap to adjust the volume and a long hold to skip through your playlist. Well reviewed for a budget-friendly price, the TaoTronics TT-BH22 are a worthy contender for those want a pair for about one hundred bucks. 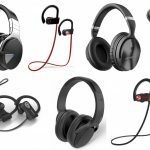 While most of the headphones included on this list feature the over-the-ear design, the Phiaton BT 100 NC headphones appeal to the ear bud crowd, who is looking for subtle rather than obvious design in their headphones. Best for the exercise crowd, these headphones are water and sweat resistant, and make sure that you are specifically in your own “zone” by utilizing noise cancellation technology. So all of that outside noise that always seems to get in your way as you’re trying to focus on your workout? Conveniently gone without having to blast your volume at a noise-deafening level. 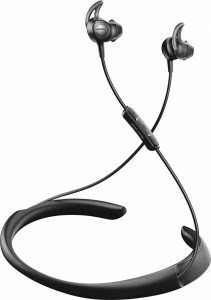 They’re also hands free, which allows you to use Bluetooth capability (if applicable) to answer calls while you’re in movement. Simple vibrations also let you know when you have received a message or have an incoming call, so you don’t have to have your device in your hand at all times to make sure you don’t miss any notifications (or hear a voice notification while you’re in a flow). A band around your neck and discreet ear buds are both comfortable and functional, and assist in making the Phiaton BT 100 NC headphones one of the best noise cancelling in-ear headphones with Bluetooth around. 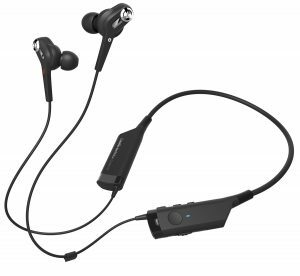 Continuing to look at headphones of the sweat proof variety that aim to please the exercise enthusiasts, the Linner NC50 headphones offer a hands-free noise cancellation earbud option for a budget-friendly price. Tangle-free chords slip comfortably around your neck to ensure that they stay in place through all of your movement, and can last up to a (pretty high for in-ears_ thirteen hours when fully charged. The built-in microphone makes sending and receiving calls a simplistic gesture, and the Bluetooth capability lets you connect to two different devices at the same time. As for the noise cancelling option, it merely takes the flip of a switch to activate, and to help get you in your “zen” mood to stay focused on whatever the day may bring. A high quality option at a reasonable price, the Linner NC50 headphones will appease those who do (or don’t) enjoy being on the move and help them to stay in their zone. We recently wrote a Linner NC50 review that may be of interest if you’re planning on buying these. 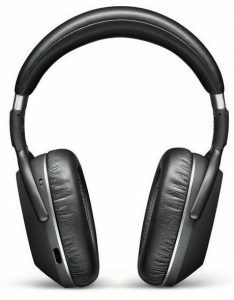 Our final option on this list is the Mpow H5 headphones, the most reasonably priced of all of the headphones presented, while still maintaining the same degree of being regarded as one of the best Bluetooth noise-cancelling headphones on the market. After two hours of charging, these headphones can last for up to eighteen hours to accommodate your music and hands-free phone calls during your day. Built to eliminate low-frequency noises, these over-ears are best used in places that won’t be overly stimulating in their noise production, such as a commute across town or an airplane ride where your need your “tunes”. Like many others in here, all adjustments can be made directly on the headphones, including volume and song selection, as well as turning on the noise-cancellation option. These headphones also have a portable design, easily folding and fitting into their included carrying case for transportation ease. Also built for comfort, the H5 have adjusting ear cups that can rotate up to 90 degrees, and a headband with extra padding to maximize comfort. 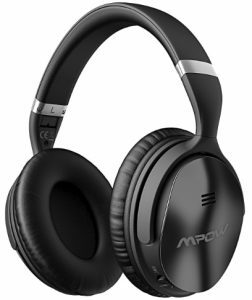 A high quality option for a reasonable price, the Mpow H5 offers to cap off our list strong as a great pair of Bluetooth noise-cancellation headphones for all budgets.